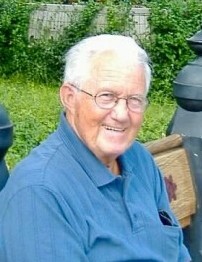 James (Jimmy) Gallagher, 88, of Mt. Dora, Florida, passed away on October 18, 2018. He was born on October 20, 1929 in Manhattan, NY to the late James and Margaret (nee Deasy) Gallagher. Jimmy was married for 59 years to his beloved and devoted wife, Barbara (nee Chandler), who predeceased him in 2008. Jimmy is survived by his cherished daughters and sons-in-laws: Carlene and Jeff Endick, Frances and Eddie Ribachonek, Kathy and Russell Thomas, and Laura and Doug Katz; his treasured grandchildren: Ian, Jennifer, Dana, Lauren, Matthew, and Kate; and his adored great-grandchildren: Patrick, Farrah, Lia, Ryland, Ella, Gabriel, Piper, Nicholas, and Liam. Jimmy was predeceased by his dear siblings: Barbara Darby, Thomas Gallagher, and Patricia Lennon. Jimmy and Barbara raised their children in the Bronx where Jimmy, a lifetime BCTGM Union member, worked as a machinist for Thomas’ and Stella D’Oro Bakeries. Jimmy was a true New Yorker and he loved his home city, especially Central Park. An avid walker, Jimmy would regularly walk from the Bronx to Manhattan, and always said “a good walk cleared the mind”. Jimmy was a generous man with a quick sense of humor. He adored his wife and four daughters and was very proud of his family. He will be dearly missed by his family and friends. Funeral Mass, Our Lady Queen of Peace Chapel at Gate of Heaven Cemetery, (10 West Stevens Ave, Hawthorne, NY, 914-769-3672) on Thursday, October 25, 2018 at 12:00 PM. Interment service afterwards; followed by a luncheon to celebrate Jimmy’s life at Casa Rina of Thornwood Restaurant (886 Commerce St, Thornwood, NY 914-769-4515). In lieu of flowers, memorial donations may be made to the American Diabetes Association (1-800-342-2383, www.diabetes.org), or to the charity of your choice.